Hi everyone. It’s me, Chris. Today’s blog is a short one, but good nonetheless. 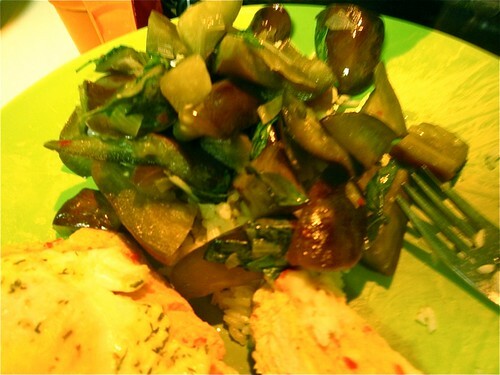 I made a Thai Basil Egglplant dish the other day that’s very easy and quick to make. Tasty as well. I have a small garden next to the house. This year it hasn’t been very productive, save for a couple of things. 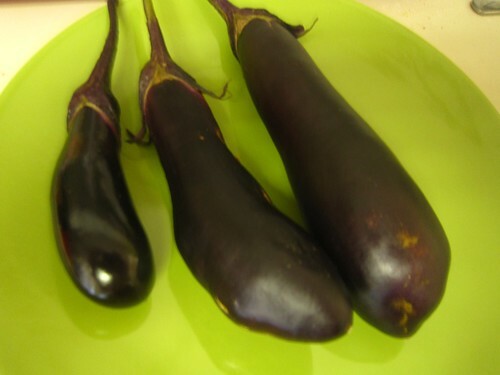 One of those is a Japanese eggplant. 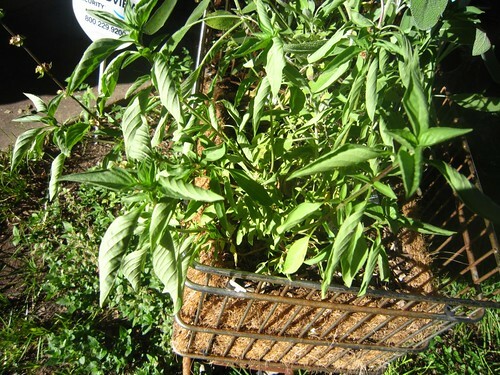 We also have a small herb garden/grocery cart that has ripe Thai basil, so this dish worked out perfectly. 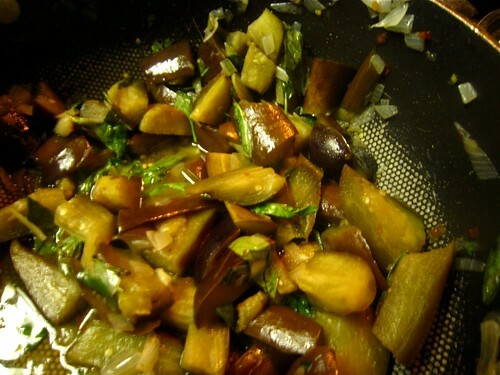 The recipe is called Thai Basil Eggplant, but you can use any kind of eggplant you want. I used Japanese because that’s what I had. 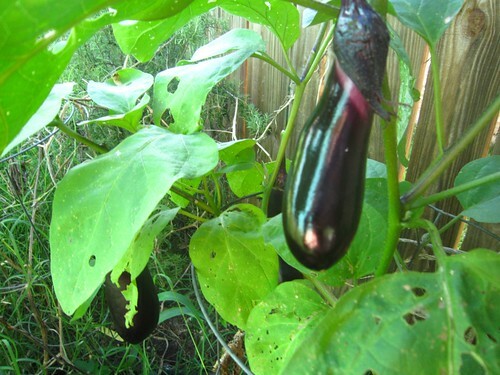 I picked the eggplants, washed them and cut them up into irregular shapes. I read that you should do this because cutting them into flat discs makes them prone to sticking to the pan. Set them aside. 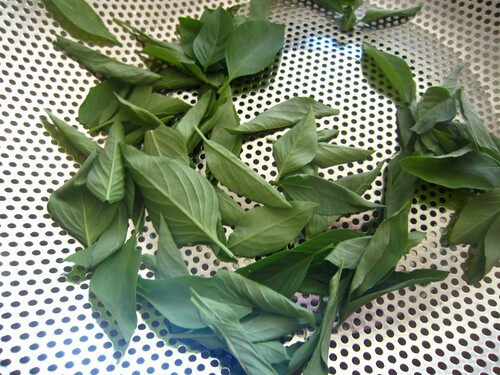 Next I picked a good amount of the Thai basil. Unlike the eggplant, I probably wouldn’t use regular sweet basil for this. However, it might be good, so try it if you want. Thai basil isn’t the easiest thing to find. In fact, I think the only place we could find it was by purchasing a live plant. Wash the basil and cut it up. Set aside. Cut up the shallot and chili peppers. The original recipe called for garlic, but we had this shallot laying around, so I used that instead. I thought that might offset the fact that I didn’t have any peppers. It did and it turned out just fine. This is all up to you. Heat the oil in a deep pan and saute the chili peppers and shallot until it’s golden brown. Next, add the eggplant and a cup of water. Stir and cover. Let the eggplant cook until translucent, which will take anywhere from 5-10 minutes depending on the size of the pieces, etc. The original recipe said that most of the water should have been cooked off or absorbed by this point. However, it wasn’t. So, I just poured the water out of the pan and returned the pan to the stove. Next add the sugar and fish sauce and give a good stir. Turn off the heat and stir in the basil. Serve immediately with a nice rice. I think we had Jasmine, but I’m sure any kind will do. Enjoy! Posted October 5, 2010 & filed under Cooking Crafts. This sounds yummy. Good looking photos too. It smelled yummy, but alas he made it during the height of my morning sickness and I could not bring myself to try it.